Japanese Evacuation of Guadalcanal including loss of the Chicago, 28 January–8 February 1943. Following the decisive Battle of Guadalcanal, 11–15 November 1942, the Japanese had withdrawn their major sea and air strength from the Solomons and retired to lick their wounds in the security of Truk, Jaluit, and other distant bases. Efforts to supply and support their dwindling forces on Guadalcanal were limited to harassing air attacks on Henderson Field, interspersed with high-speed round trips by the “Tokio Express,” operating from Bougainville Island under cover of darkness. It was one of these fly-by-night missions which was intercepted by a U. S. cruiser force in the Battle of Tassafaronga on 30 November. In the resulting action, Japanese losses were measured in destroyers, while we suffered the loss of the heavy cruiser Northampton, as well as serious damage to other heavy cruisers. Doubtless the enemy compared this cheap success favorably with the costly defeats which had shattered his major task forces. Doubtless, also, many of his heavy units surviving those actions were still under repair. At all events, during the ensuing two months he placed his reliance on the Tokio Express, and it continued to dash in, unload, and dash home with apparent disregard for the substantial losses inflicted by our PT boats and planes. Nevertheless, the use of fast, light craft to support Guadalcanal was foredoomed to failure. The Tokio Express had been thoroughly tried out in October and November, and its inability to transport heavy materiel and large-scale reinforcements had contributed to the Japanese decision to launch the disastrous Battle of Guadalcanal. Now it proved more inadequate than ever. Our land and air superiority on the island was developing at a rate which no stopgap system of supply could hope to counter. Indeed, as the end of January approached, the situation of the enemy’s ground establishment was becoming desperate. Keeping in mind the demonstrated tenacity of the foe and the previous history of the campaign, it was a reasonable assumption that a supreme effort to retake the island would be initiated before Japanese resistance collapsed entirely. Such an operation seemed all the more likely because there had now been time for the enemy to repair and reconstitute his surface forces and replenish his carrier air groups. Consequently, when late January brought heavy increases in Japanese shipping at Buin and Rabaul and an intensification of air activity, Admiral William F. Halsey, Jr., Commander South Pacific and South Pacific Force, surmised that the zero day might be close at hand. Poised to meet any thrust and to protect our continued troop movements into Guadalcanal was the greatest concentration of U. S. naval power yet assembled in the South Pacific. No less than six major task forces were available in the area. Ships on hand included seven battleships, two carriers, three auxiliary carriers, three heavy cruisers, seven 6-inch light cruisers, two 5-inch light cruisers and many destroyers. Two task forces were built around the carriers Enterprise and Saratoga. One included three new battleships, the Washington (F), North Carolina, and Indiana, and one the four old battleships New Mexico (F), Colorado, Maryland, and Mississippi. Another was composed of four light cruisers of the Brooklyn class with attendant destroyers. The sixth included three heavy cruisers, three auxiliary carriers, and three light cruisers. On duty at Guadalcanal itself was a task group comprising the destroyers Fletcher, De Haven, Nicholas, and Radford, as well as miscellaneous other combatant vessels. Chevalier (F, Comdr. Alvin D. Chandler, ComDesDiv 41), Comdr. Ephraim R. McLean, Jr.
During the 28th, Task Force GEORGE and the transport group proceeded toward Guadalcanal without incident, while other units sortied from port in accordance with operation orders from COMSOPAC which noted a possible strong enemy movement into the southern Solomons and assigned all commanders the general duty of destroying any Japanese forces encountered. 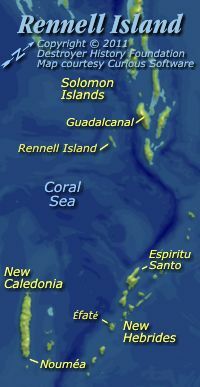 Task Force ROGER (Rear Admiral DeWitt C. Ramsey), composed of the Saratoga (F), San Juan, Case, Maury, McCall, and Saufley, departed from Noumea at 1100 under orders to reach latitude 16° 30' S., longitude 157° 00' by 0300 30 January. Task Force LOVE ONE (Rear Admiral Willis A. Lee, Jr.), including the Washington (F), North Carolina, Indiana, Balch, Cummings, Dunlap, and Fanning, left at the same time, headed for the same general area. At 1600 Task Force SUGAR (Rear Admiral Frederick C. Sherman), comprising the Enterprise (F), San Diego, Ellet, Hughes, Morris, Mustin, and Russell, sortied from Espiritu Santo, New Hebrides, bound for a rendezvous with Task Force ROGER on the 30th. Lastly, at 1800, Task Force AFIRM (Rear Admiral Walden L. Ainsworth), with the Nashville (F), Helena, Honolulu, St. Louis, Drayton, Lamson, O’Bannon, and Reid, left Noumea for the rendezvous with Task Force LOVE ONE. By the evening of 29 January, Task Forces ROGER, LOVE ONE, SUGAR, and AFIRM were operating in an area bounded by the parallels 14° and 17° 20' S. and the meridians 157° and 162° E., from 250 to 420 miles south and southwest of the main body of Task Force GEORGE as it closed the southeast coast of Guadalcanal. Task Force LOVE TWO (Vice Admiral Herbert F. Leary), with the New Mexico (F), Colorado, Maryland, Mississippi, McCalla, and Woodworth, remained in port at Nandi, Fiji Islands. (a) From 3 to 10 Japanese submarines were disposed in the area in which the Task Force was operating. (b) A large number of Japanese fighters and bombers had appeared at Guadalcanal during the forenoon of the 28th indicating that air attack could be expected. (c) A Japanese movement in strength toward the southern Solomons was anticipated. (d) Night air attack might be tried out. At 1035, Task Force GEORGE passed within visual distance of the transport group on its way to Guadalcanal. At that time and continuing into the afternoon numerous aircraft were picked up by radar. Many planes did not show IFF, but this did not cause particular anxiety on the part of the Task Force Commander. IFF was known not to be discernable a large part of the time. The equipment then employed was delicate and had a tendency to get out of order because personnel were unfamiliar with its use. Also pilots occasionally failed to energize the proper circuits. At 1244 Capt. Wyatt, commanding the task group containing the auxiliary carriers Chenango and Suwannee, asked permission to launch search planes to locate possible “snoopers” in the Indispensable Reef-San Cristobal area. Admiral Giffen authorized this flight for 1500, the time already set for the detachment and retirement of the carrier group. Since wind was light and from the southeast, earlier launchings would have required the carriers to reverse course to head into it, thus delaying the entire group in its effort to reach the position assigned by COMSOPAC for 2200 (latitude 10° S., longitude 159° 40' E.). During the afternoon, the radars of the Force continued to pick up and report unidentified planes on various bearings. Some of these turned out to be units of the covering patrols in which IFF was not registering. At intervals of about half an hour, aircraft approached as close as 20 miles. At 1500 the Chenango and Suwannee, with the Frazier and Meade as screen, were directed to carry out their retirement to the southeast. The auxiliary carriers were, however, to continue to provide air cover for the users during the remainder of the afternoon and on the following morning. A rendezvous was set for 0800 30 January in latitude 11° 37' S., longitude 161° 23' E. about 90 miles southeast of Cape Henslow, Guadalcanal. After clearing the Task Force, the carriers launched their patrols and search planes. A flight from the Suwannee, composed of four VF and three VT, then remained over the cruisers until about 1800, returning to land aboard before sunset. Chenango aircraft maintained patrols over the carrier group and also searched the Indispensable Reef-San Cristobal area. After recovery of planes about nightfall, the two auxiliary carriers continued their retirement in a southeasterly direction. (1) He could break radio silence and vector out his air patrols. (2) He could proceed on evasive courses which might confuse hostile aircraft but which would also prevent arrival of the Task force at the designated 2200 point. (3) He could steam directly for this point, relying on air cover, ships’ armament, and future change-of-course maneuvers for protection. The latter procedure was adopted. Admiral Giffen desired to reach the point specified by COMSOPAC for 2200. Widely evasive courses could not be steered if this was to be accomplished. Nor did the Task Force Commander think it advisable to assume an air defense formation. Such a step would increase the vulnerability of the Force to submarine attack at a time when CINCPAC was warning of an increased Japanese submarine concentration south and southeast of Guadalcanal, and when available destroyers had been reduced by the detachment of the auxiliary carrier group. As the afternoon waned, visibility remained excellent, although the sky was 80–90% overcast with the ceiling at about 2,000 feet. In the west there was a narrow belt of blue between the cumulous cloud mass and the horizon, so that after sunset the glow continued for a time. The sea was calm, and the wind was blowing from 120° T, with a force of about 4 knots. The heavy cruiser Chicago was the second ship in the righthand column, directly astern of the Wichita. She had not gone to General Quarters, but all ZEBRA fittings were closed except those needed for ventilation and immediate access. Condition of Readiness TWO was in effect, with antiaircraft guns manned, full boiler power maintained, and continuous CXAM and SG radar search being conducted. The Force was darkened. As the sun went down, the combat air patrol passed overhead on its return to the Suwannee. A few minutes later the Edwards’ SC radar picked up a flight of unidentified aircraft approximately 30 miles away, which closed and passed down the port side of the Force about 15 miles distant. Other ships also were recording the presence of these planes. Soon after 2000 the rest of the Task Force began to make contact with various groups of aircraft between 25 and 50 miles distant. Some of these showed IFF. The La Vallette finally sighted a formation of planes, 12 to 18 in number, about 12 miles off the port bow on a southerly heading. Their character could not be ascertained, but they were probably friendly. At 2009 the Columbia went to General Quarters. At the time her radar was recording two groups of friendly planes and several other aircraft. A minute later the Chicago picked up a large unidentified flight 25 miles to the westward. It was tracked and found to be drawing aft and closing slightly. It made a wide circle to the left and at 2020 was about 14 miles astern, a position which afforded the planes a measure of invisibility and also silhouetted the Task Force against the western horizon. The bogies closed rapidly. Radars began to make many contacts with low-flying aircraft which in general were within 10,000 yards. The large group of planes astern continued its wide circle around the Task Force until it was slightly abaft the Chicago’s starboard beam. Search and FC radars aboard that vessel showed that the aircraft had divided into two groups at ranges of approximately 10,000 and 17,000 yards. The Wichita noted another flight which approached to within 8 miles on the port bow. The action began between 2023 and 2024 when the Waller was strafed by an incoming plane and immediately opened fire. The Chicago joined in with her 40-mm. guns and followed with the starboard 5-inch battery in radar control. Simultaneously she went to General Quarters and set Material Condition ZEBRA. One plane was believed to have crashed between the Chicago and the Waller. Two others approached the cruiser from two points abaft the starboard beam, and one of them launched a torpedo at 500–600 yards. Both the torpedo planes crossed ahead of the Chicago, apparently undamaged, but another crashed off the port quarter under the fire of the cruiser’s automatic weapons. At about 2024 the Wichita also received a strafing attack. A Mitsubishi type 1 approached from abaft the starboard beam and passed low over the bow. Another plane of the same type dropped a torpedo on the starboard quarter at a distance of about 500 yards. It missed. About six more planes, some with running lights on, came from astern and passed close aboard to port. At 2025 speed was increased to 27 knots. Shortly thereafter, the Louisville opened fire on a low-flying plane to starboard at a distance of 1,500 yards. A wake was soon sighted, and the Louisville heeled over in answer to hard left rudder. The torpedo passed 25 yards ahead. All the ships of the formation were now in action. The attackers appeared to be concentrating on the heavy cruisers. The Louisville felt a heavy shock, probably a torpedo dud. At least some of the aircraft were thought to be carrying two torpedoes, although this is dubious in view of the distance they must have traveled. When the planes were to the eastward of the ask Force, they were hard to see except in the light of tracers. At 2030 the first attack ended. It was now dark, and antisubmarine zigzag was discontinued in accordance with earlier orders. No evasive maneuvers were instituted in its stead since enemy planes now apparently surrounded the formation, and the Task Force Commander believed that any immediate change of course not only would be ineffective but would increase the phosphorescence of the wakes. About five miles on the starboard hand there were blinking float lights on the water and white flares in the air. Some of these were quite high and relatively dim. They drifted down very slowly. The float lights were evenly spaced and had the appearance of quick-flashing navigational lights. Other lights blinked to port and ahead. The enemy was apparently marking the course of the Task Force in the darkness. All cruisers and destroyers were throwing up a heavy volume of fire. Several planes were seen to burst into orange flames and crash. Although no concerted evasive maneuvers were being employed, ships maneuvered individually when attacked, and some of the destroyers steered irregular courses without losing their positions in the screen. At 2036 the Columbia fired on a plane coming in low and fast on the port bow. It crashed without burning. Two minutes later, the Chicago’s starboard 5-inch battery opened on aircraft approaching on the starboard beam, range 10,000. The fire was taken up by the automatic weapons as the planes came in. One crashed on the starboard quarter of the Waller. Another off the Chicago’s starboard bow was hit repeatedly by automatic fire and exploded close aboard on the port bow. It flared up brilliantly and silhouetted the Chicago for other planes to starboard, which took advantage of the situation to concentrate their attack on that cruiser. Two minutes later she was struck by a torpedo at frame 100 starboard. The wake had not been seen. All ship control was lost, three shafts were thrown out of commission, and a marked list to starboard set in. The after engine room and evaporator room were flooded, as well as No. 4 fireroom and after gyro room. The Chicago’s automatic weapons continued to fire, and two more planes crashed in flames, one on the port bow (also under fire by the Wichita) and one on the port quarter (also under fire by the Louisville), repeating the silhouette effect. There was another two-minute interval, and then a second torpedo hit was scored on the starboard side. This time a wake was seen, but the Chicago could not maneuver. The explosion occurred at about frame 30 and sent a column of water 200 feet into the air. All engines stopped, and turbo-generator power was lost. The list increased to 11°. The ship was reported to be settling aft. No. 3 fireroom was flooded, as well as other compartments. Auxiliary power from the diesel generators was cut into the emergency circuits to operate emergency lighting, fire pimps, and radio motor generators. The Louisville swerved to starboard to avoid the Chicago and the burning aircraft in the water and increased her speed to 30 knots to close the Wichita. At about this time the Columbia noted a line of float lights which had been dropped directly across the path of the Task Force, probably as a directional guide for the attacking planes. Until 2050 the radar plots of the Japanese planes looked like a “disturbed hornets’ nest,” in the words of Admiral Giffen. But after this time the aircraft began to circle to the westward. The main body of the Task Force, which had reduced speed to 15 knots to lessen the phosphorescence of wakes, steamed on various courses in the neighborhood of the stricken Chicago. Shortly before 2100 a change of course to 120° T. was begun. During the execution of this maneuver, the Conway found herself cutting across the bow of the Wichita from port to starboard, and the ships cleared by about fifty feet as the result of backing and turning maneuvers by both. A lone Mitsubishi type 1 dropped two torpedoes about 200 yards off the Wichita’s starboard quarter. One broached and ran parallel to the ship to starboard. The other came directly for it. An underwater blow and scraping sounds were heard. Another abortive attack was then delivered from the port quarter. One planed was downed by the automatic weapons of the Louisville. About 2115 the attack was over. By 2130 the Chicago had checked her list at 11°. About six feet of freeboard remained aft. The OTC had directed the Louisville to get ready to tow, and that vessel left the formation with the La Vallette, Edwards and Taylor as screen. At 0055 the Chicago and Louisville had succeeded in passing and securing the towline in total darkness, with personnel literally feeling their way. The decision to take the Chicago under two while continued air attack was still possible was dictated by the increasing submarine hazard, since radio silence had been broken, and by the necessity of putting as much distance as possible between the damaged vessel and her present position because the even greater likelihood of air attack by daylight the next day. During the remainder of the night the Wichita and Conway maneuvered to the eastward of the Chicago, Louisville and their screen, which now consisted of the Edwards, La Vallette, and Waller. The Chicago group was making good a course of 130° T. and a speed of about 4 knots. The light cruises of the Task Force with their screen maneuvered to the westward. CINCPAC estimated that 11 to 13 Japanese were destroyed by the antiaircraft fire during the night torpedo attack of the 29th, the first of its kind ever launched by the enemy. There was no way of judging how many aircraft were involved, but the number must have been substantial. As usual, the participating ships made high claims of planes shot down, because of duplications and bad visibility. Total enemy losses as recorded by the Task Force were 17 destroyed, 12 possibles, and 2 damaged. (1) Self-disclosing fire was encouraged by strafing, by the use of running lights, and, after contact had finally been lost, by the dropping of isolated flares. (2) Many blinking float lights were laid (other flashing lights were perhaps aboard planes). These were visible both to port and to starboard, often coinciding with bogies observed on radar screens. Each flashed at regular intervals, but there was no synchronization between the individual lights. The float lights were probably rendezvous markers and beacons for attack runs. They also served the purpose of encouraging self-disclosure, for at least two ships took them under enthusiastic fire. (3) Surface flares of about 50,000 candlepower were employed, as well as red, green, and white parachute flares of much lower intensity, possibly to give the appearance of airplane running lights, thereby drawing fire. The white parachute flares were too dim to serve as illumination. The Japanese made many runs on our ships without taking offensive action. In spite of their elaborate efforts to mark the position of the vessels with lights and self-disclosing fire, they were probably unable to distinguish targets a good part of the time. It is noteworthy that both torpedoings of the Chicago occurred when she was not only illuminated by the fire of her entire antiaircraft battery but silhouetted as well by blazing enemy aircraft. Conversely, the flashes of our 5-inch guns made it supremely difficult for the automatic weapons to locate the attacking a planes. Shortly after midnight Task Force SUGAR (the Enterprise) was directed by COMSOPAC to close Task Force GEORGE, conducting searches and providing air coverage at dawn. A Black Cat plane from Guadalcanal arrived to cover the Chicago during the night. Meanwhile, the damaged cruiser took all possible steps to correct her list and to plug leaks. Bucket brigades and submersible pumps were used to keep the water down in mess compartments No. 1 and 3. Damage control parties extinguished small fires in the galley and Radio II. Bulkheads abaft the flooded engineering spaces were shored. It had been considered questionable whether the ship would remain afloat, but frequent checks indicated that buoyancy was being maintained. After learning of the attack on the Chicago, the Chenango and Suwannee set their course for a point about 60 miles southeast of Task Force GEORGE’s estimated daylight position. It was decided that after the first dawn launchings, the auxiliary carrier group would head to intercept Task Force SUGAR during the morning. This decision was confirmed by order from COMSOPAC. The Chenango was scheduled to launch at 0550. However, at the appointed time it was raining, the ceiling was low, and there was hardly any wind. It was still dark as well, and the pilots were not experienced in night flying. Nevertheless, it was thought that the Chicago group might be attacked at dawn, so the risk had to be taken. At 0600 the Chenango launched seven fighters as a combat air patrol and three search planes. These arrived over the Wichita about an hour later, when it was just light enough to pick up the ships. The Suwannee had been designated to provide air protection over the auxiliary carriers themselves, but weather conditions were so bad that she did not launch until dawn. At 0655, the Enterprise also launched a six-plane combat patrol to cover Task Force GEORGE. Shortly after daybreak the tug Navajo (Lt.(jg) Frank Rigley), escorted by the flush-decker Sands (Lt. Comdr. John J. Branson), joined the Chicago group. By 0900 the tow had been transferred from the Louisville to the Navajo. At about 0815 Task Force GEORGE was sighted by search planes from the Enterprise. It was then about 35 miles north of the eastern end of Rennell Island and heading southeast at about 4 knots. The Chicago was leaving a heavy oil slick. The three light cruisers were maneuvering in column to port, while the Wichita was patrolling the starboard side. Lt. (jg) R. D. Gibson, pilot of one of the search planes, transmitted the position of the Force to the fighters of the Enterprise combat air patrol which was to cover it and gave the fighter frequency to the Louisville by message drop. On the way back to the Enterprise, Lt. Gibson located the auxiliary carriers and asked for their fighter frequency by message drop. This information was given by blinker and was duly reported to the Enterprise on Lt. Gibson’s return at 1100. Admiral Giffen directed Capt. Davis of the Chicago to transfer wounded and excess personnel to destroyers while headway was lost during the passage of the towline to Navajo. Capt. Davis inquired if it would be possible to send the wounded to hospital in a special ship at high speed, but he was informed that no vessel could be spared because of the submarine menace. In view of the strong probability of another air attack and the precarious buoyancy of the Chicago, Capt. Davis decided to keep all uninjured personnel aboard to fight the ship and continue damage control measures. At noon the Chenango and Suwannee joined Task Force SUGAR and came under the command of Admiral Sherman in the Enterprise. About a half-hour later the course of the combined Force was changed to 140° T. Thereafter easterly and westerly courses were steered, with Task Force SUGAR remaining to the southeast of the Chicago, at a distance of about 50 miles. The Enterprise attempted to maintain fighter direction of the planes covering the Chicago, but it was discovered that the distance was too great. At 1235, however, fighters were vectored out from the Enterprise herself to chase a bogey which had been picked up to the southwest at a distance of 40 miles. The F4F-4’s pursued the “snooper” 40 miles to the northeast but were unable to catch it at its estimated speed of 200–220 knots. This bogey then circled Task Force GEORGE. It was tracked until 1400, when it faded from the Enterprise screen. Presumably it provided the enemy with full information on the situation. 1400 Admiral Sherman directed the Chenango and Suwannee to operate independently of Task Force SUGAR. The auxiliary carriers continued to maintain patrols over themselves and task force GEORGE. At a time variously stated to have been between one and two hours later, the Louisville and the light cruisers of Task Force GEORGE formed on the Wichita, in obedience to orders from COMSOPAC, and with the Chevalier and Taylor departed for Éfaté at 25 knots, leaving the Chicago a circling screen composed of the Conway, Edwards, La Vallette, Sands, and Waller, with Capt. Davis of the Chicago in command. At 1534 Admiral Giffen had directed the Chenango and Suwannee to afford air cover for the Chicago into Espiritu Santo, but this dispatch was delayed in transmission and did not arrive until 1825, after the Chicago had again been attacked. The base course of the Chicago group was 135° T. The Navajo was towing at about four knots. Shortly after Task Force GEORGE split up, Radio Guadalcanal broadcast a warning in plain language. This stated that 11 unidentified twin-engine aircraft had been sighted 130 miles from Guadalcanal at 1545 on a bearing of 268° T. The message was received by the Chicago group at 1643 and by the Enterprise at about the same time. From it the Enterprise was able correctly to gauge the time of arrival of the enemy planes. She launched additional fighters, but these did not make contact with the Japanese. Because of the delay in receipt of Admiral Giffen’s message, the Chenango and Suwannee received no orders to provide further air cover until too late. However, the auxiliary carrier group had recognized that late afternoon would be a likely time for an attack on the damaged cruiser, and a special flight of 19 fighters and four TBF’s was launched at 1645. The planes reported sighting the main body of Task Force GEORGE about 30 miles from the Chicago. Receiving no directions from the Wichita, where it was assumed they were en route to cover the Chicago, whey headed for the latter ship’s group but arrived too late to take part in the ensuing action. Soon after the warning from Guadalcanal, four aircraft of the six-plane combat air patrol being maintained over the Chicago by the Enterprise sighted an enemy reconnaissance plane and shot it down after a 40-mile chase. At 1654 the Enterprise’s CXAM radar reported a group of bogies 67 miles away, bearing 300° T. The ship went to General Quarters and prepared to repel air attack. Ten additional fighters were launched to augment the combat air patrol of four F4F-4’s over Task Force SUGAR and six over the Chicago. The latter planes were vectored out 20 miles on course 190° T. and intercepted a group of 12 twin-engine Mitsubishi type 1 torpedo bombers which were heading for the Enterprise. At this time they were only 17 miles from Task Force SUGAR. Upon being intercepted within sight of the Enterprise, they turned left and headed at high speed for the Chicago. The turn enabled the combat air patrol to close and shoot down one plane and possibly two more. The four-plane patrol over the Enterprise sighted the enemy and joined in the chase. Up to four more planes were shot down by Enterprise fighters as they plunged into the antiaircraft fire of the Chicago’s screen. The La Vallette’s SC radar had picked up the enemy planes at 1707 when they were 50 miles away, bearing 205° T. At 39 miles the FD radar made contact. When the aircraft were 28 miles away, radar plot reported that there were 11 of them. The La Vallette went to General Quarters. At 1715 the Waller made contact with unidentified aircraft 12 miles away. The bearing was now 214° T. Five minutes later the Chicago, still under tow by the Navajo, saw 11 planes approaching from 7 miles away, in a flat V formation bearing about 215° T. She did not sight our combat air patrol, although it was reported to be attacking the enemy about this time. The Chicago’s starboard 5-inch commenced fire in local control, range 8,000. Automatic weapons opened at extreme ranges. Two planes approaching to starboard were seen to dive into the water when under Chicago fire. Another with one engine blazing tried to crash the cruiser but missed the stern and dell off the port quarter in flames. A fourth plane went down about 3,000 yards on the port quarter, under fire from the Chicago’s port battery. One plane crashed on the port bow, probably shot down by the Navajo. The Chicago was now aware that our fighters were attacking the enemy, and some difficulty was experienced in keeping the antiaircraft fire off them. Meanwhile the Chicago’s screen, 3,000 yards away, had also been engaged. The La Vallette swung to the right to bring the enemy formation on the beam but did not speed up as she would then have removed herself from the most likely track of the Japanese aircraft. Two enemy planes were seen destroyed by our fighters. At 1721 the La Vallette opened fire at 10,000 yards. It so happened that she was the only unit of the screen in the approximate line of the enemy’s approach, while three of the screen were on the disengaged side. She reported shooting down two planes at 7,000 yards and others later. Though in less advantageous positions, all other vessels reported hitting and downing from one to five planes. As the enemy aircraft crossed the Chicago’s track, they were reengaged by the Enterprise fighters which, together with antiaircraft fire, accounted for the remaining Japanese planes with the exception of two, one of which was damaged. After antiaircraft fire had ceased, and all enemy aircraft were shot down or were being engaged by fighters, five torpedo wakes were observed approaching the Chicago from the starboard beam. The ship had three knots towing speed but could not be maneuvered. At 1724 the first torpedo exploded at frame 33 starboard, and a flood of water and debris fell on the forecastle. A few seconds later three more torpedoes exploded in rapid succession between frame 60 and 80 starboard. The fifth missed astern. Immediately after the first torpedo hit, it was apparent that the Chicago would sink rapidly. The Navajo cut the tow wire with an acetylene torch, and the Chicago’s Commanding Officer ordered abandon ship. Most of the life rafts and floater nets had been cast loose and placed on deck during the previous night, but their launching was difficult because of the list to starboard. However, all survivors managed to leave the ship in time. At 1743 the Chicago rolled over on her side and settled by the stern, colors flying. The La Vallette, exposed as her position was, had succeeded in avoiding several torpedoes. However, one finally struck her in the forward engine room. The ship’s shell was badly damaged for 48 feet on the port side, centered at frame 94. The keel was hogged 14 inches and snapped at frame 93. The forward fire and engine rooms were flooded and the latter seriously wrecked. The forward bulkhead of the after fireroom was strained and cracked. One officer and 20 men were killed. At 1915 the Chenango received a message from Guadalcanal warning of 11 twin-engine and 8 single-engine planes on a southeasterly course near Vella Lavella Island at 1809. The plotted track of these planes would bring them over the auxiliary carriers at 2030. It was probable that the Japanese were attempting to duplicate the success of their attack night before. As darkness would have set in by 2030, and it would be impossible to provide fighter cover over the carrier group at that hour, the Chenango and Suwannee recovered their aircraft and retired at full speed toward a rain squall which was then about 3 miles distance. At 2140, when it was evident that the enemy planes had not reached the vicinity, a night retirement course of 127° T. was taken. The La Vallette had been directed to steam toward Espiritu Santo by COMSOPAC. Feed water was lost at 2100 and the Navajo commenced towing. The Chenango and Suwannee were not apprised of this turn of events, however, nor had any information been given them previously regarding the speed of the La Vallette. Consequently the auxiliary carriers did not know what course would enable them to reach the neighborhood of the damaged destroyer at daybreak and provide air coverage. Course was therefore set to intercept her at dawn if she was making 15 knots. At 0700 of the 31st, fighters and torpedo planes were launched to search back along the estimated course of the La Vallette. Contact was established after flying 80 miles, and the Chenango and Suwannee closed at 15 knots. Two planes were sent over the La Vallette group to make message drops so that local fighter direction might be established. After giving proper recognition signals, the aircraft flew along the destroyers so that they could surely be identified before making their message drops. Wheels and flaps were lowered as an additional precaution, and each plane began an approach on a separate destroyer. At masthead height they were taken under fire. One plane was damaged and the pilot slightly wounded. The aircraft returned to the carriers, which approached to TBS range and made arrangements over the air for fighter direction. At 1235 the Cummings (Comdr. George O. Cooper) from Task Force LOVE ONE and the O’Bannon (Lt. Comdr. Donald J. MacDonald) from Task Force AFIRM joined the La Vallette group. In view of the large number of survivors and the slow rate of advance, authority was requested for the original screen to proceed to port. This was granted, and the Conway, Edwards, Sands, and Waller took all Chicago survivors aboard and left the formation. The La Vallette, under tow of the Navajo and with the Cummings and O’Bannon as screen, reached Espiritu Santo on 1 February. The combined score claimed by ships and the Enterprise combat patrols on the 30th amounted to 31 aircraft destroyed, four possibles, and six or more damaged. The Enterprise group alone reported that it had downed 10 planes and damaged another. The La Vallette claimed six kills, one possible, and one damaged. The Edwards’ score was five shot down, and the Chicago reported three destroyed, one possible, and several damaged. Actually there were many duplications in the accounts given by participants in the action. Only 11 or 12 enemy planes conducted the attack. Of these, 10 were shot down, one was damaged, and one escaped. As an interesting sidelight on the action, the report of the Conway suggested that the Japanese might have developed a “dead man safety” device to keep planes in normal flight after pilots had been killed or severely wounded. It was noted that enemy aircraft advanced uniformly without change of course or altitude until about 2,000 yards after drops had been made. At this point at least five of them suddenly veered off to the left and crashed. Source: US Navy Office of Naval Intelligence Combat Narrative: Japanese Evacuation of Guadalcanal Including loss of the Chicago, 28 January–8 February 1943.